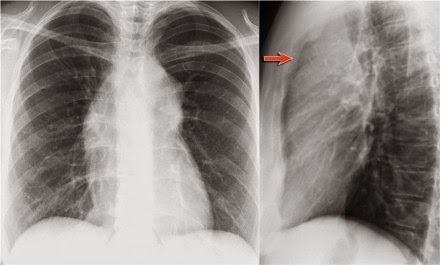 The chest x-ray is the most frequently requested radiologic examination. In fact every radiologist and pulmonary physician should be an expert in chest film reading. The interpretation of a chest film requires the understanding of basic principles. On the PA chest-film it is important to examine all the areas where the lung borders the diaphragm, the heart and other mediastinal structures. Line or stripe - for instance the right para tracheal stripe. These lines and silhouettes are useful localizers of disease, because they can be displaced or obscured with loss of the normal silhouette. This is called the silhouette sign, which we will discuss later. The paraspinal line may be displaced by a paravertebral abscess, hemorrhage due to a fracture or extravertebral extension of a neoplasm. Widening of the paratracheal line (> 2-3mm) may be due to lymphadenopathy, pleural thickening, hemorrhage or fluid overload and heart failure. Displacement of the para-aortic line can be due to elongation of the aorta, aneurysm, dissection and rupture. The anterior and posterior junction lines are formed where the upper lobes join anteriorly and posteriorly. These are usely not well seen and we will not discuss them. 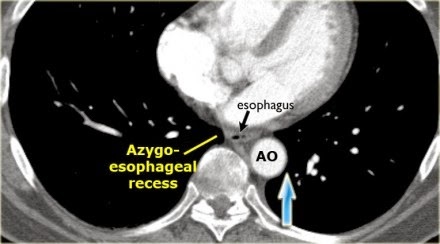 An important mediastinal-lung interface to look for is the azygoesophageal line or recess (arrow). 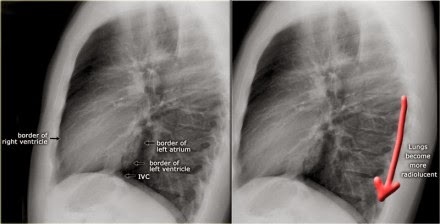 The azygoesophageal recess is the region inferior to the level of the azygos vein arch in which the right lung forms an interface with the mediastinum between the heart anteriorly and vertebral column posteriorly. 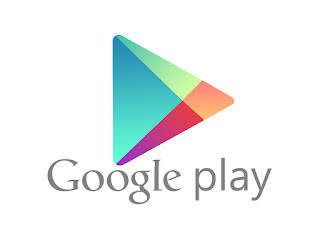 It is bordered on the left by the esophagus. 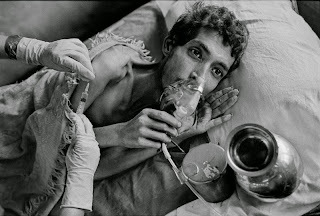 · Notice the deviation of the azygoesophageal line on the PA-film. · It is caused by a hiatal hernia. A common normal variant is the azygos lobe. The azygos lobe is created when a laterally displaced azygos vein makes a deep fissure in the upper part of the lung. On a chest film it is seen as a fine line that crosses the apex of the right lung. Here another patient with an azygos lobe. The azygos vein is seen as a thick structure within the azygos fissure. 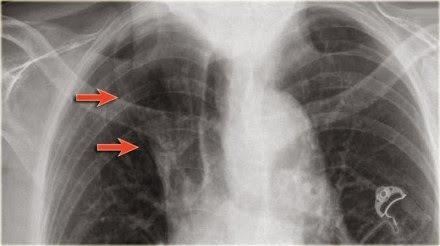 In some patients an extra joint is seen in the anterior part of the first rib at the point where the bone meets the calcified cartilageneous part (arrow). This may simulate a lung mass. 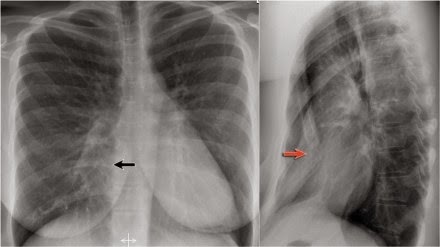 In patients with a pectus excavatum the right heart border can be ill-defined, but this is normal. 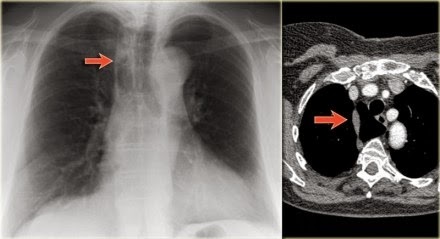 It produces a silhouette sign and thus simulating a consolidation or atelectasis of the right middle lobe. The lateral view is helpful in such cases. Pectus excavatum is a congenital deformity of the ribs and the sternum producing a concave appearance of the anterior chest wall. On a normal lateral view the contours of the heart are visible and the IVC is seen entering the right atrium. The retrosternal space should be radiolucent, since it only contains air. Any radiopacity in this area is suspective of a proces in the anterior mediastinum or upper lobes of the lung. 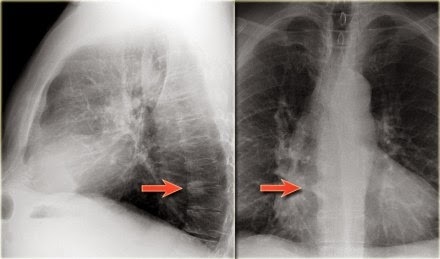 As you go from superior to inferior over the vertebral bodies they should get darker, because usually there will be less soft tissue and more radiolucent lung tissue (red arrow). If this is not the case, look carefully for pathology in the lower lobes. The contours of the left and right diaphragm should be visible. 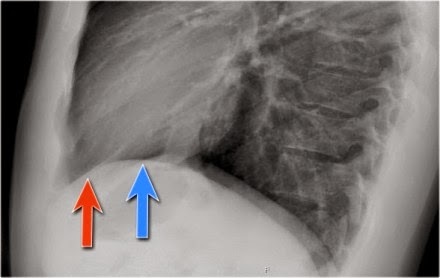 The right diaphragm should be visible all the way to the anterior chest wall (red arrow). Actually we see the interface between the air in the lungs and the soft tissue structures in the abdomen. 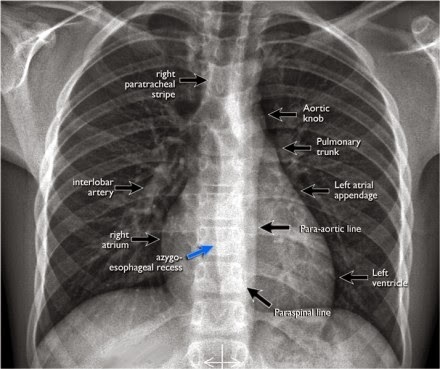 The left diaphragm can only be seen to a point where it borders the heart (blue arrow). Here the interface is lost, since the heart has the same density as the structures below the diaphragm. passes over the left main bronchus and is higher than the right pulmonary artery (in blue) which passes in front of the right main bronchus. Once you know how the normal hilar structures look like on a lateral view, it is easier to detect abnormalities. In this case on the PA-view there is hilar enlargement. On the PA-view it is not clear whether this is due to dilated vessels or enlarged lymph nodes. On the lateral view there are round structures in areas where you don't expect any vessels. So we can conclude that we are dealing with enlarged lymph nodes. Notice also the widening of the paratracheal line (or stripe) as a result of enlarged lymph nodes. On the lateral view spondylosis may mimick a lung mass. Any density in the area of the vertebral bodies should lead you to the PA-film to look for spondylosis, which is usually located on the right side (arrows). On the left side the formation of osteophytes is hampered by the pulsations of the aorta. On the PA-view the superior mediastinum is widened. 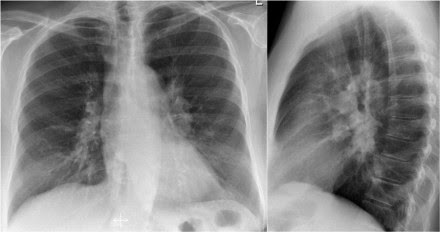 The lateral view is helpful in this case because it demonstrates a density in the retrosternal space. Now the differential diagnosis is limited to a mass in the anterior mediastinum (4 T's). 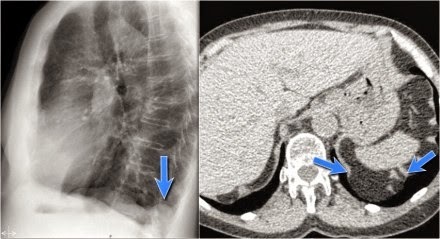 A common incidental finding in adults is a Bochdalek hernia, which is due to a congenital defect in the posterior diaphragm (arrows). In most cases it only contains retroperitoneal fat and is asymptomatic, but occasionally it may contain abdominal organs. Large hernias are sometimes seen in neonates and can be complicated by pulmonary hypoplasia. A hernia of Morgagni is also a congenital diaphragmatic hernia, but is less common.